Hearts have confirmed the pre-contract signing of veteran striker Steven MacLean, who will join the Tynecastle side from St Johnstone in the summer. The 35-year-old striker has agreed a two-year deal and will join up with his new club when his current contract at McDiarmid Park comes to an end in the close season. Speaking to HeartsTV, MacLean told how Hearts boss Craig Levein was keen for him to help out the younger members of the squad as well as setting his sights on a regular starting spot. MacLean added: “I’ve got plenty of experience and I’ve played at some big clubs in my time. I’ve played in different leagues as well and I’ve learned from some top players over the years. “Hopefully I can bring that side to the younger ones and help them along the way. I’m also hopeful that I can nail down that spot in the team. “I want to come here and do well, and hopefully we can finish as high up the league as possible. “I know the league and I know everything about Hearts. I know they’ve got passionate fans and I’ve played at Tynecastle a few times. St Johnstone said on their website that MacLean had signed a two-year deal with the Edinburgh club, ending a six-year spell in Perth. MacLean’s current manager Tommy Wright said: “Hearts contacted us last week to let us know they were speaking to Steven and the expectation was that he’d sign for them on a pre-contract. “It’s a shame to see him go, but we wish him all the best because he’s been a fantastic servant to this football club since he joined in 2012. “I don’t think Steven owes the club or I anything. “He’s been an asset to the squad both on and off the pitch and has been a great example for our younger players. “I’m probably the manager he’s played under the longest in his career and he’s always done fantastic for me. 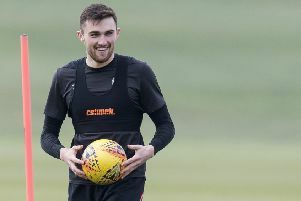 Levein wants MacLean’s experience on board next season as Hearts continue nurturing young strikers Aidan Keena, Rory Currie, Euan Henderson and Anthony McDonald. The former Rangers and Sheffield Wednesday striker hit 53 goals for St Johnstone.